Start Winning Pool with Hypnosis! Play pool (billiards) better than ever with this powerful self-hypnosis mp3 by Dr. Steve G. Jones! Improve your abilities with an effective secret weapon: Hypnosis! Discover your true ‘pool shark’ potential like never before, and get the edge over your opponents! Do you take your pool games seriously? If so, the Winning Pool Hypnosis MP3 is the sure way to improve your game. In fact, hypnosis is effective in improving concentration, building confidence, and blocking disturbances that can get in the way of you playing your best game possible. Hypnosis works to enhance your pool playing abilities through a serious of relaxation methods that prepare the mind to accept positive reinforcement necessary to succeed. Once the mind is cleared of this interference the focus and concentration needed in making precise pool moves can happen each time you play. While pool is a game of angles, force, and a little luck, hypnosis can calm you and help you make the right moves. The process takes place away from the pool table when you can completely relax and focus only on the hypnotic messages. The tools needed are ingrained into your mind in just a few short weeks. Then the stored information can work both consciously and subconsciously as you concentrate on each pool move. Improving your pool game isn’t just about winning. Pool is a social sport that is played at home, in bars or pubs, or restaurants. In can help break the ice among strangers and be a relaxing hobby enjoyed any time. Building social confidence by being a qualified pool player can be achieved through hypnosis. 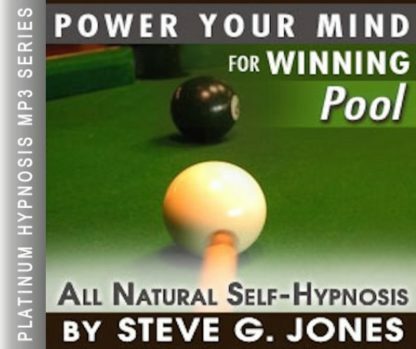 Clinical Hypnotherapist, Steve G. Jones has created a program for both the serious pool player and those who just want to have more fun through an improved game. His program, Winning Pool Hypnosis MP3, uses the time-tested methods of hypnosis to bring out the best in you. It’s easier than you think. Imagine having the power to be as successful as you’ve dreamed!!! Steve G. Jones, Ed.D., Clinical Hypnotherapist, charges $1,500 for a custom recording and $25,000 for a one-hour private hypnotherapy session at his office. But you can get all the benefits for this low price. Simply listen to the Winning Pool Hypnosis MP3 session every night as you go to bed for three weeks and feel the changes happening in your life. You will feel more empowered, more in touch with your true self, and you will truly know that your goals are within your reach. Steve G. Jones achieves AMAZING and LASTING results!!! Hypnosis is the easiest way to affect change in your life because the positive messages go straight to your subconscious mind effortlessly so you can accomplish your goals and reach for the stars!! All you have to do is listen to the Winning Pool Hypnosis MP3 download at night as you go to sleep!!! You’ll hear soft music, the gentle sounds of the beach, and the soothing sound of Steve G. Jones’ voice all working together to bring about positive changes in your life easily and naturally. Steve G. Jones has been helping people improve their lives with hypnosis for over 17 years…now it’s time for him to help YOU… don’t wait, do it NOW !!! you’ll be glad you did. See you at the top! And as you continue to relax, you imagine yourself now playing pool, so relaxed, so confident. See yourself breaking, that’s right. A perfect break. See yourself lining up your first shot. Your skills as a pool player are very impressive and day by day you are becoming a better and better pool player. People notice you and they regard you as an amazing pool player and from now on you will consider yourself to be an amazing pool player. You’re able to make every shot easily and effortlessly. Imagine yourself now, making a bank shot, easily and effortlessly. It is almost as if all the geometric possibilities present themselves to you and you can make your selection. Your knowledge of the game of pool is increasing day by day. Your more and more clam and relaxed and focused as you play. You find yourself seeking advice from other players whom you respect. You find yourself practicing on a regular basis. And even during those times when you are not playing, you mentally review your games, learning from the past to make the next game your best game ever. You are constantly improving your pool playing abilities by mentally reviewing strategies and knowledge. You are so relaxed, so at ease, realizing now just how amazing you are at playing pool, becoming more and more calm at the game, more and more focused at the game, day by day. As now you relax deeper and deeper. Pool is a game of skill and strategy. Being able to be successful and win at pool, you must have strong analytical skills to be able to analyze all the different angles and possibilities. Hypnotherapy allows you to enhance your abilities at playing pool. Pool requires focus, concentration, analysis, and skill. This powerful Winning Pool Hypnosis MP3 will give you all of these things so that you become successful at winning pool. This hypnotherapy program will allow you to visualize different angles and prepare you to make the perfect shot. Hypnosis will also give you the self-confidence you need to succeed at pool. We suggest you listen to this Winning Pool Hypnosis MP3 recording for 21 nights in a row as you allow the powerful suggestions to reprogram your subconscious mind. You will see improvement in your game in as soon as one day. You will see increased focus, increased skill, and improvement in your game. You can be a WINNER at pool!